DIRECTOR Kevin Davies, Dirk Campbell, Roy Battersby, Mary McMurray, Crispin Reece, Colin Bucksey, and Sarah Hellings. STARRING Judy Loe, Indra Ove, Angus McInnes, Bruno Eyron, Julia Bremermann, Kourosh Asad, William Oliver. 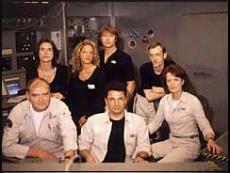 SYNOPSIS Space Island One is a short sci-fi drama series set in 2005 AD. Based on the Earth orbiting Space Station Unity. The Station is staffed with seven very different crew members. All scientists working for a high profile research company back on Earth. The series details the lives of Unity's dedicated staff as they cope with living and working together.